Ominous and somewhat majestic, this 3d renderings by elvenkind is desktop candy. Proposed by Tama-Neko and highlighted by biriwilg. This is gorgeous! Of course, I am partial to blue, but I love the little details i the image, like the faded amount of tech elements, and the swirls and whatnot. I like how th elighting on top makes it feel like you're underwater, seeing the rays of sunlight filter through the waves. i love this sort of wallpaper. is it done with apophysis? i mean those lightning stuff. Cool! It's a work of art.. ^^ Feels like your in outer space or in the deepest of oceans..^^ Nice one! Awesome underwater abstract wallie ! Excellent work, I think I will need to download this. I love the lightning, and how you added little detail to that image. This goes to my fav. th thing in the center is cool beyond belief, but the other parts are kind of grainy, and the sheet of light is kind of plain, but overall its a really cool abstract, i would like to see one with more focus on the render myself. O_____O how the heck do you do something like that? it's blimey good i say. it just looks fabulous and the blue tone is just perfect. lighting's really good too. it's good to see another brilliant work from you (it's been ages). As soon as I saw this I fell in love with it. It's an amazing wallpaper. 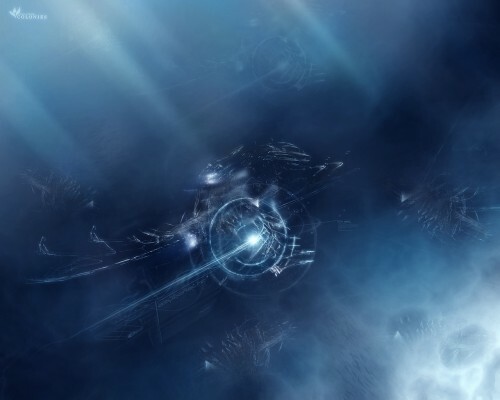 Space, underwater, whatever it is, it looks great! Everything just fits together nicely. Wonderful. Really great work you done! It looks complex, but as a whole it's simple and simple enough for me to look for long time. Great job! If possible, teach me how to make it! Beautiful! Beautiful! Thanks for sharing! that is some serious quality! omg,s awesome pic and love da icon hope we can be friends! Nice abstract vision....seems like a distant, another dimension realm...you did a great job! *2 thumbs up* ^^ Hope you be fine, greetings!